If you own a pub, a bar, tavern, or a wine bar you need a website for your establishment. These premium themes below allow you to build a professional website quickly using WordPress. WordPress offers you numbers of themes which include online booking and reservation systems, event management tools, eCommerce support, and social media sharing and integration features. Each page, each home page, every layout is so carefully designed and settled for the single purpose of being relatable to a bar or a pub experience. Also, these themes helps to display your location and some information, these themes will bring life to your Bar and Pub website with optimized UX and UI. Also, you can add custom features like pre-booking a table, etc. making your choices and options truly limitless. Porter Pub is a great tavern, craft beer pub, restaurant or diner website. 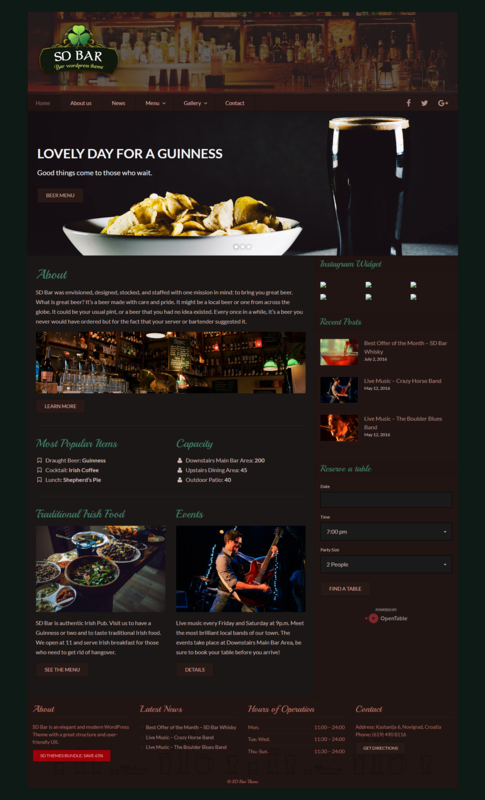 The theme is designed specially for restaurant and tavern websites which guarantees you fancy look for you beer pub or bar site, easy setup and powerful features for building your restaurant or bar menu. GastroBar a modern, responsive WordPress theme that comes fully decked out with powerful elements and with a vast collection of carefully created, modern homepages. The theme is great for all kinds of food-service businesses and pubs. Craft Beer is a responsive WordPress theme. The theme is exclusively built for craft beer, brewery, pub or beer house websites. It is retina ready, fully responsive and easy to customize. It has been tested to work across devices, from the largest of desktops to modern smartphones. 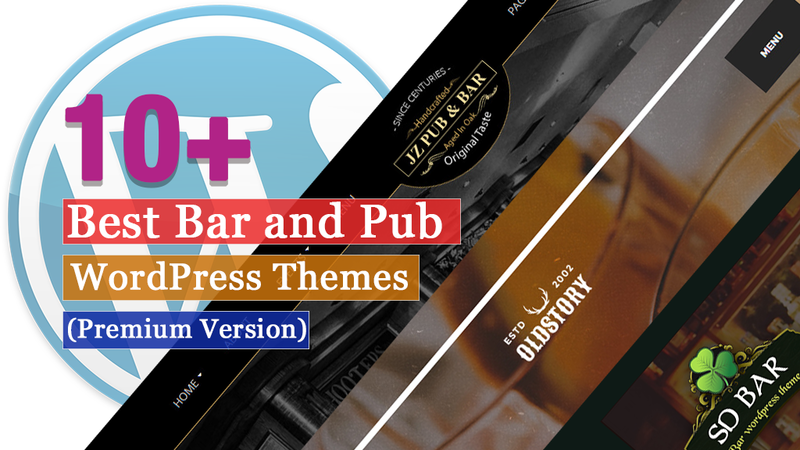 Jz Pub & Bar is a sophisticated pub & bar theme for WordPress Platform. The theme is modern, robust and amazingly customizable with lot of options and includes; Multiple Premium Sliders, Events Management., Shop., Visual Composer., Blog, Menu, Multiple Headers and Footers, One Click Import. and many more features. OldStory is an modern, impressive website for Whisky Bar or Pub WordPress Theme. The has functional and modern design and lots of customizable features. The theme is a perfect fit a restaurant, cafe, cocktail bar, coffee shop, brewery, tavern, bartender career and more. The theme has an intuitive visual interface and informative layout that looks wonderful on any platform. VintClub is a fully responsive and handcrafted Pub and Whisky Bar WordPress Theme. It is specially dedicated to multiple business types. The theme offers many various possibilities which will help you easily create a beautiful, stunning and unique website. Tavern is a stylish, modern and responsive trendy Brewery WordPress Theme. It is crafted for modern beer house, pub, cafe, bistro, bar, restaurant. The theme perfectly fits beer fast company, private brewery, corporate vinery, family brewery business, food & drinks blog. SD Bar is an responsive elegant and modern WordPress Theme. The theme has great structure and user-friendly UX. The theme has specifically for Bars & Pubs. It includes these plugins: Gallery, Food&Drinks menu, Homepage slider. Brewski is a theme crafted to perfection packed with elements ideal for every beer bar, brewery and pub. The theme has useful features such as the beer showcase layouts, restaurant menu, working hours or event news, and other great feats every pub, brewery or beer bar website needs. Food & Drink modern, clean & fresh WordPress theme. The theme make an impressive online presentation of your beautiful restaurant, cafe, bar, catering, diner store, bakery, brewery business and so on. The theme is great for any cuisine european and asian (european, japanese, chinese, korean quesene). Daiquiri is an elegant authentic WordPress theme. The theme is created for modern bartending and catering business. The theme is an fresh & clean option for you if you’re offering your services as a bartender during special events, like wedding, anniversary parties, birthday party, and corporate business company banquets. In this article, you can find some of the Best Premium Bar and pub WordPress Themes that come with many useful and powerful features. And also includes a beautiful design that helps to attract the numbers of customers to your site easily. Previous articleQuform vs FormCraft vs eForm – Which the Best WordPress Form Builder Plugin?